KW Variant 2 Coil-over System for MINI R50, R52, R53 (4/02-11/06). This comes complete with 60mm springs and perches selected specifically for the MINI and also mates up perfectly with Vorshlag 60mm camber plates. Like all KW coil-over systems the strut bodies are all stainless steel with stunning eye appeal. 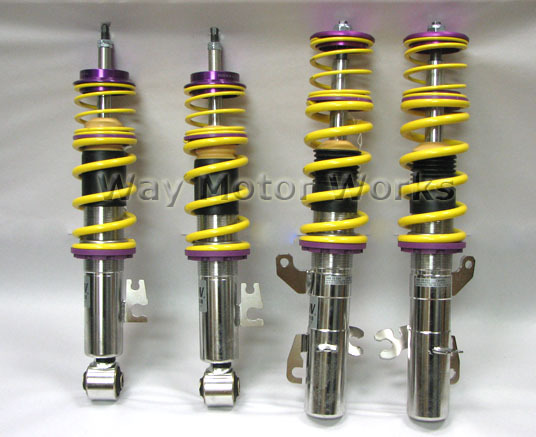 The KW V2 coil-over system includes ride height adjustment with single dampening and rebound adjustment for those MINI enthusiasts who want to lower their ride and dramatically increase handling performance for spirited driving, auto-cross and track.